Washington, DC is the capital city of the United States. The city, commissioned by the Continental Congress in 1783 and designed by architect Pierre L'Enfant, is laid out with tree-lined avenues that radiate out from the Capitol Building like spokes of a wheel. The District of Columbia is named for Christopher Columbus, and the city is named for George Washington, the USA's first president. 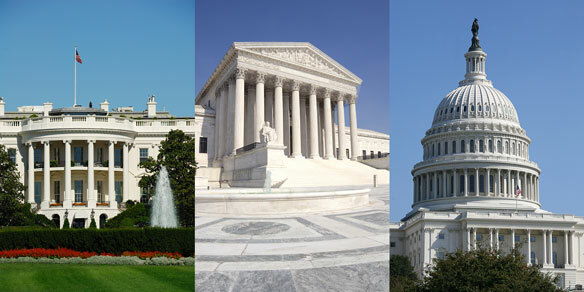 Pictured above, from left to right, are the White House, the Supreme Court, and the Capitol Building, headquarters for the Executive, Judicial, and Legislative branches, respectively, of the United States government. The map below depicts downtown Washington, showing its interstate highways and major roads, as well as important government buildings and points of interest. The White House, United States Capitol Building, and four Presidential Memorials are featured on the map. For more detailed maps of Washington, DC, visit Washington-DC-Map.com.